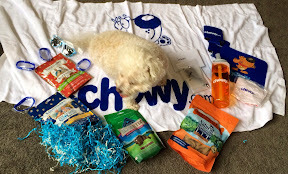 bichonpawz: A BIG Surprise from Chewy!! A BIG Surprise from Chewy!! 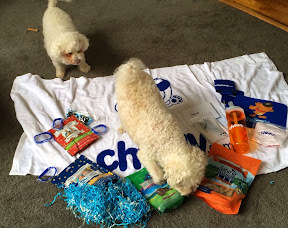 We were so surprised to get a big box from Chewy that we had not ordered! There was all kinds of cool stuff in the box! A new beach towel, a new water bottle, mousepad, cup-holders, bracelets, sunglasses and the BIG hit with the girls...TREATS!! You all know how much we love Chewy and we want to say THANK YOU! We love all of our cool stuff!! What a supernice surprise! Chewy is the very best! We've always heard excellent things about Chewy and how they are like your second family. What a GREAT surprise you received. We know you'll enjoy all those goodies. Yea for Chewy. Pawsome swag. Enjoy. Have a marvellous Monday. Woah, what pawsome loot! Chewy seems so wonderful! Oh, you got lots of fun stuff too?!? 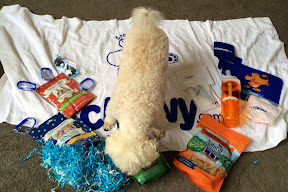 We love Chewy.com over here! They are pawtastic. Wow that's great! Enjoy some super summer day with all that fabulous things. I specially like the stuffing of that box, it's great to decorate the house! Yes, isn't that wonderful?? Did your mom let you keep the sunglasses? 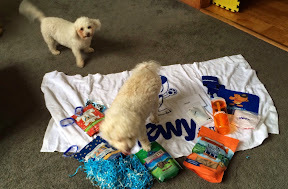 Chewy sent out some wonderful boxes to so many - we too love Andrew and his team. We have to get a post ready for our latest review too! 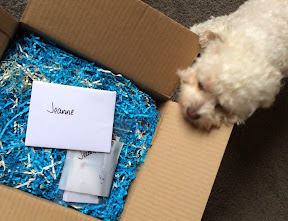 That's a wonderful package of stuff from Chewy! We can see your blurry tail showing how happy you are! This is awesome! We hadnt heard of Chewy, we will have to check it out! Thanks for sharing the cute pics! We love the folks at Chewy! Hi Jeanne, What lucky friends you are. I agree that Mr. Chewy is simple wonderful! You are the second friend who has received such a wonderful gift box-Mr. Andrew is just the best.